UChicago Medicine Comprehensive Cancer Center at Silver Cross Hospital - New Lenox offers advanced, personalized cancer care that's closer to home. 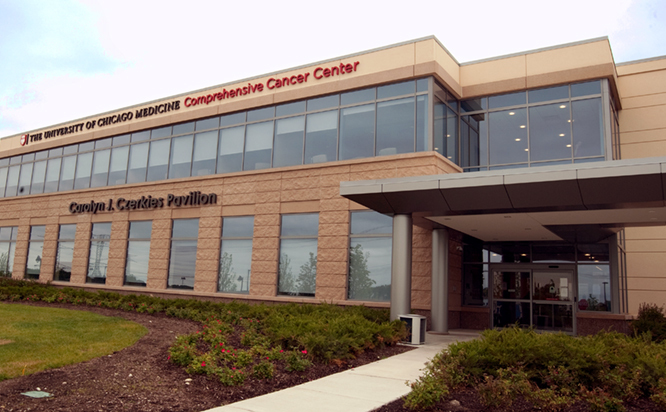 Our world-class oncology team provides state-of-the-art treatment for adults in a convenient Will County setting. Our services include radiation therapy, on-site chemotherapy and infusion treatments, pre- and post-transplant care for stem cell transplantation, as well as cancer screenings and supportive care services such as patient support groups. And our robust clinical trial program gives patients access to novel medications and treatments before they're widely available. Free parking, including valet, is available on-site. Patients come first at the UChicago Medicine Cancer Care at Silver Cross Hospital - New Lenox. We assess your individual needs and offer specialized treatments, state-of-the-art technology and compassionate care in your community. Our team treats all types of cancers, including colon, breast, prostate, lung, renal and pancreatic cancers, as well as lymphoma and leukemia. Gynecologic cancer care is offered across the street in Pavilion A, just a short walk from our main outpatient location at Silver Cross Hospital. The UChicago Medicine Comprehensive Cancer Center maintains more active clinical trials for cancer treatment than any other cancer care program in Illinois. These promising new drug, surgical or radiation therapies are not typically available to patients in a community hospital setting, but are a cornerstone of our advanced care in Will County. Please call us at 815-300-1400 to inquire about participating in a clinical trial or visit our clinical trials page to learn more. Our chemotherapy and other infusion treatments are provided on-site in a comfortable setting staffed by specially trained cancer nurses. Our oncologists also have expertise treating rare cancers, such as germ cell tumors and clear cell carcinomas. With some cancers, particularly lymphoma, certain immunotherapy medications are given together with your on-site chemotherapy treatment. Immunotherapy helps boost the immune system in fighting the cancer. At UChicago Medicine Cancer Care at Silver Cross Hospital - New Lenox, our expert radiation oncology team uses the advanced Truebeam system to deliver a range of radiotherapy treatments. Initial consultation and evaluation, plus pre- and post-stem cell transplantation care services are available at UChicago Medicine Cancer Care at Silver Cross Hospital - New Lenox. The actual stem cell transplant procedure typically requires a hospital stay and is performed at our main location in Chicago's Hyde Park neighborhood. Select patients may be candidates to receive outpatient stem cell transplantation services. Many patients come to our office for treatment before or after a surgery to remove a tumor or cancer cells. If you need surgery, our team works closely with your surgeon to ensure your comprehensive care. Our physicians coordinate care with their surgical colleagues at Silver Cross Hospital, UChicago Medicine's main Hyde Park campus as well as many other hospitals. Cancer care goes well beyond chemotherapy, radiation therapy and surgery. That’s why we’re committed to being a resource for you and your family. We offer an array of supportive care services on-site, including a cancer resource center, support groups, rehabilitation services and social workers. A variety of patient support groups and classes are available through community partnerships with the American Cancer Society, Gilda's Club and others. Our Cancer Resource Center is available to you and your family. There, you’ll have access to fact sheets and other helpful materials about specific types of cancer, treatment options, pain management and other aspects of cancer care. It's crucial to receive proper nutrition while fighting cancer. Experienced dietitians are available to develop individualized nutrition plans. The Rehabilitation Institute of Chicago at Silver Cross Hospital provides cancer rehabilitation services at Silver Cross Hospital and two outpatient locations in New Lenox and Joliet. Social workers experienced in counseling cancer patients and their families are available to help you cope before, during and after cancer treatment. Social workers assist with referrals to community organizations and with coordinating practical resources such as transportation to and from treatment. They can also act as a bridge to the medical care team. Private consultations are available on Mondays and Fridays between 12:30 p.m. and 4 p.m. Call 800-550-0680 to schedule your consultation.